Hawai'i Volcanoes National Park, near the town of Volcano on the Big Island of Hawai'i is the second largest tourist attraction in the entire state (second to Pearl Harbor) and receives over a million visitors a year. The park consists of over 323,000 acres of land stretching from sea level to the summit of Mauna Loa at 13,677 ft. Much of the park is accessible to visitors and includes hundreds of trails as well as steam vents, active volcanoes and lava flows. Click here if you are interested in learning about current volcanic activity and the accessibility of red hot lava. The national park straddles the Ka'ū and Puna districts. If you are coming from Hilo, the park entrance is 30 miles southwest on Highway 11. 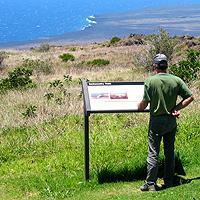 If you are coming from Kailua-Kona, the park entrance is 96 miles southeast on Highway 11. The park is open 24 hours a day, year round. The Visitors Center opens at 7:45 AM and closes at 5:00 PM. The Jaggar Museum opens at 8:30 AM and closes at 5:00 PM. With over 323 thousand acres, Hawai'i Volcanoes National Park is huge. Only a portion of the park requires a fee to access - but the fee is extremely reasonable. Considering that there are weeks worth of activities, hikes and drives to partake, the park is something you don't want to pass by. Getting In For Free Want to avoid paying the park entrance fee? The park entrance is open 24 hours a day but only collects fees during normal business hours. While sometimes the rangers arrive early or leave late, if you get to the park just before sun-up you are almost always guaranteed free entrance. If you already have a National Park Pass, Golden Eagle Pass, Golden Age Pass (for US Residents 62 and older) or Golden Access Pass (for US Residents permanently disabled) you can get in at no additional cost. If you do not have one of these passes, the best deal is the Vehicle Permit that gives you 7 days of access for $10 - very reasonable. If you are an individual (e.g., hiker, biker, motorcycle etc) the fee for a 7 day access pass is $5. If you are a local resident - or you visit Hawai'i more than once a year you should consider the Tri-Park Annual Pass for $20. This pass not only gets you into Hawai'i Volcanoes National Park, but also into Pu'uhonua o Hōnaunau Historical Park (City of Refuge, near Kona) and Haleakala on Maui for a full year. Within the park boundaries the Kilauea Visitors Center, Jaggar Museum, Volcano House Hotel and Volcano Art Center are all wheelchair accessible. Additionally there are many places, while driving around the park, where you can pull over for beautiful views without having to leave your car. Fresh drinking water can be found at the Kilauea Visitor Center, Volcano House Hotel, Jaggar Museum, Thurston Lava Tube and the Namakani Paio campground. Restrooms can be found at Kilauea Visitors Center, Volcano House Hotel, Kilauea Overlook, Jaggar Museum, Thurston Lava Tube, Namakani Paio Campground, Kīpuka Puaulu picnic area, Mauna Ulu, Kulanaokuaiki Campground and at the end of Chain of Craters Road. All restrooms are wheelchair accessible. Hot meals are available at the Volcano House Hotel. It also has a snack bar and a lounge serving cocktails such a Pele's Fire. Sundries can be purchased at the gift store. Volcano Village also has a couple of restaurant if you don't want to eat at the hotel. Hiking through the park can mean moving though various climates. The park headquarters, and quite a bit of the driving and hiking trails are at 4,000 ft above sea level. You can figure about 5 degrees cooler weather for every 1,000 ft you go up so at 4,000 ft it will be about 20 degrees cooler than at sea level. 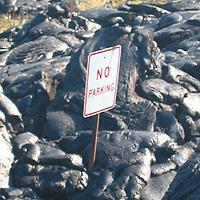 However, there are large portions of the park that are at sea level, including the active lava flows and ocean entries. Because of this you should pack for both extremes. It is a good idea to bring lightweight rain gear, hats, sturdy hiking shoes, water, sunglasses and sunscreen. 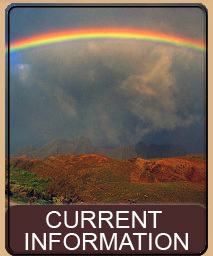 Because the park is dead center between the very wet Puna district and the very dry Ka'ū district portions of the park can experience rain while other portions of the park are dry and sunny. The Big Island is the youngest island in the Hawaiian chain. It is also the only island with currently erupting volcanoes - creating new land every day. 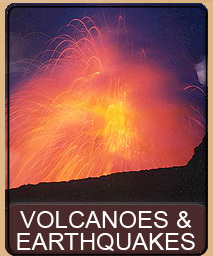 At the time of the early Polynesian voyagers, Mauna Loa, Kilauea and Mauna Kea may all have been erupting. With some of these volcanoes being over 13,000 ft tall, the fiery red glow would have been visible - like a giant lighthouse - for hundreds of miles. 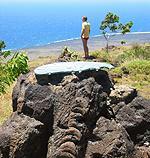 Certainly the erupting volcanoes were partly responsible for the early Polynesians landing on the Big Islands shores. Unlike much of the world's volcanoes, which can be highly explosive, the Big Island volcanoes tend to be more gentle and rarely explode or produce pyroclastic flows. 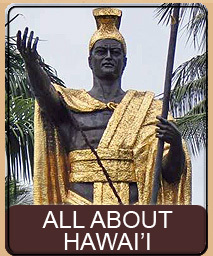 Because of this fact, the early Hawaiians had fairly easy access to the lava flows and would come and pay their respect to Pele. The Hawaiian word pele (pay-lay) not only was the sacred goddess of the volcano but also meant anything having to do with lava (the lava itself was pele, as was the volcano, etc). The first westerners to view Kilauea up close were the missionaries William Ellis and Asa Thurston who visited Kilauea in 1823. Soon other curious westerners began to visit the volcano and in 1846 a small grass shelter was built for the many visitors. In 1866 the grass shelter was replaced with a building - the Volcano House Hotel, to house visitors including Mark Twain. This first hotel had thatched walls and roof. In 1877, a wooden Volcano House, built by William Lentz, replaced the thatched hotel. It featured six hotel rooms. This was expanded into a two-story hotel in 1891 increasing the rooms to 20. About this same time Lorrin Thurston, publisher of the Honolulu Pacific Commercial Advertiser, would to come to volcano to explore. 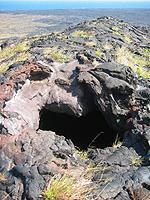 One of his discoveries was a huge lava tube which today bears his name...Thurston Lava Tube. In 1906, Thurston started an effort to turn the volcano area into a public park; his efforts were encouraged in 1912 by Dr. Thomas Jaggar who had come to Hawai'i to establish the Hawaiian Volcano Observatory to further scientific study of the volcano. Together the two convinced politicians to create a national park. The area became an official national park on August 1, 1916 by President Woodrow Wilson. Hawai'i Volcanoes National Park was the 13th national park in America. The creation of the national park encouraged more visitors to see the volcano. The Volcano House was inadequate for the increase in tourism. The existing 20 room building was thus replaced in 1921 by a two-story structure with 115 rooms - which was completely destroyed by a kitchen fire on February 11, 1940. During the rebuilding of the hotel the original 1877 structure served to accommodate guests. The original 1877 structure is today the home of the Volcano Art Center Gallery which preserves the building as a Historic Landmark (No. 42) and Hawai'i's oldest tourist hotel. Hawai'i Volcanoes National Park is a treasure trove of interesting things to see and do. With over half of the 300,000+ acres designated wilderness there are many natural sites with unusual features. 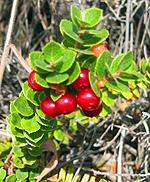 Many native species found only in Hawai'i can be seen on trails throughout the park. Much of the park is covered in native 'Ōhi'a Trees, Hāpu'u Ferns, and 'Ōhelo Berries, with wild orchids, gingers and many other tropical plants. There are two ways to see the sights at the park. First is to drive the park, with frequent stops at the various lookouts and visitor centers. This is a good way to get a feel for the various areas of the park and what is available. The second way to see the park is to hike the many trails. 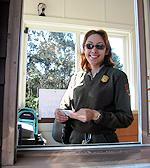 As soon as you enter the park entrance you will see the Pay Station where you will be greeted by a ranger. Provide your pass or pay the inexpensive entrance fee - and get a map of the park from the Ranger, then continue straight. On your right, just past the park entrance, you will see the Visitors Center - your first stop. The Visitors Center has information about the park, volcanoes and more. 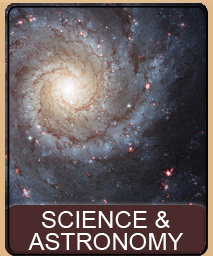 There are books you can purchase and a free video about the park, safety in the park and the active volcano. Rangers are available to answer your questions about the park and the active volcano. If you look at the map you will see that there are two primary roads in the park. The first road, Crater Rim Drive is a 12 mile loop that encircles Kilauea Caldera - and brings you back to the park entrance. Along this loop are a variety of stops and spectacular views, steaming bluffs, craters and more. About 1/3 of the way around Crater Rim Road is the Jaggar Museum where you can learn much more about how the volcano was formed, view active seismographs and see more movies about the lava. The Museum also has a spectacular view of the Kilauea Caldera and Halemaumau crater. 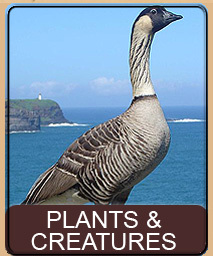 Be sure to look out for the state bird, the Hawaiian Nene as they often can be found wandering around the Jaggar parking lot. About half way around the Crater Rim Drive is Chain of Craters Road which leads all the way down to the ocean and out to the current active lava flows. 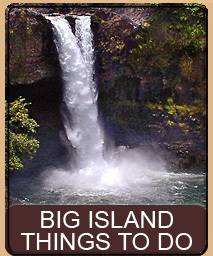 There are many insteresting sites and walks along this road, as well as an 8.8 mile side road, Hilina Pali Scenic Drive. An 8.2 mile scenic drive in the Hawai'i Volcanoes National Park passes through the Koa'e Fault, an unusual geological feature. Brown lava flows and native plants can be found through out this drive that ends at the Halina Pali overlook - a breathtaking ocean view from a 2000 foot cliff. A number of interesting stops along the way offer a chance to stroll and investigate more of Hawai'i. The real way to see and appreciate the park is by taking some of the hundreds of trails that crisscross the park boundaries. There are tails that take only a few minutes to walk, and trails that require overnight stays - pretty much something for everyone. While driving around the park is a great way to get a basic introduction to Hawai'i Volcanoes National Park, nothing beats actually getting out and experiencing the park first hand. Irredescient Fissure and Ice Cream Cone Walk - A most unusual 1 to 2 mile hike in Hawai'i Volcanoes National Park takes you to fantastic rock formations, lava tubes, fissures, colorful metallic and irredescient rocks and the lava tree known as Ice Cream Cone. Pu'u Huluhulu and Mauna Ulu Hike - A 2 to 3 mile hike in near Chain of Craters Road takes you to the top of a lush overgrown cinder cone for a spectacular view of Pu'u O'o, the active vent, and then goes on to circle the mysterious and very deep Mauna Ulu vent. 1974 Lava Tree and Keanakakoi Crater Hike - A 1 mile round trip walk in Hawai'i Volcanoes National Park takes you through a nice shaded area and out onto a 1974 lava flow. The trail continues to the backside of Keanakakoi Crater, and then backtracks and loops to your car through some of the best examples of lava tree formations on the island. 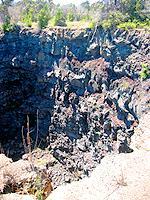 Thurston Lava Tube Walk - A 30 minute walk takes you into prehistoric times. A trail begins about 40 feet from your car in Hawai'i Volcanoes National Park. The trail takes you into a pit crater lush with huge towering plants, to the entrance of Thurston Lava Tube. This 400 year old lava tube is 600 feet long with ceilings between 10 and 30 feet. The trail through the tube is lit and a short stair and trail at the end takes you back up to your car. Hotspot Stroll - What is this strange spot along Chain of Craters Road? Suddenly all the trees are dead in a 50 acre area. A short stroll takes you into a bizarre landscape full of spongy ash and decaying trees with colorful fungus and mineral deposits. Is this a future Devils Throat? Lava Tube Tumulus and Skylights Climb - A quick climb up a 30 foot mound takes you to the top of a lava tube tumulus with several skylights that allow you to peer into the inside of the lava tube. A quick and fun exploration along Chain of Craters Road. Devil's Throat - This fast 50 foot walk near Chain of Craters Road takes you to a little known but spectacular 165 deep pit crater. This is one of the most accessable examples of a pit crater in the park. Pu'u Loa Petroglyph Trail - This short trail on Chain of Craters Road takes you to an ancient Hawaiian petroglyph field with over 15,000 petroglyphs etched into the lava rock. Steam Vent and Sulphur Bank Trail - This easy and short trail loops you from Volcano House past the steam vents then across the road to the sulphur banks and back up to the visitors center. This page is named 'Parks.hvnp'. Can't Find It?